The Nemo Veda is a two person tent that utilizes two sets of trekking poles to provide a ludicrous amount of living space at a palatable weight. Are two sets better than one? The Nemo Veda weighs 3 lbs 4 oz packed, and provides 35 square foot of floor space. The canopy is made from a waterproof, yet breathable ripstop nylon (20 denier), while the tent floor is produced from a polyurethane coated 20D Ripstop nylon. The tent includes 6 stakes, guy-out cord, a stuff sack, and a light repair kit (two patches). The tent pitches with two sets of trekking poles. One pole mounts vertically, to provide ceiling height. The second pole mounts leaning forward at an angle to provide more internal volume. 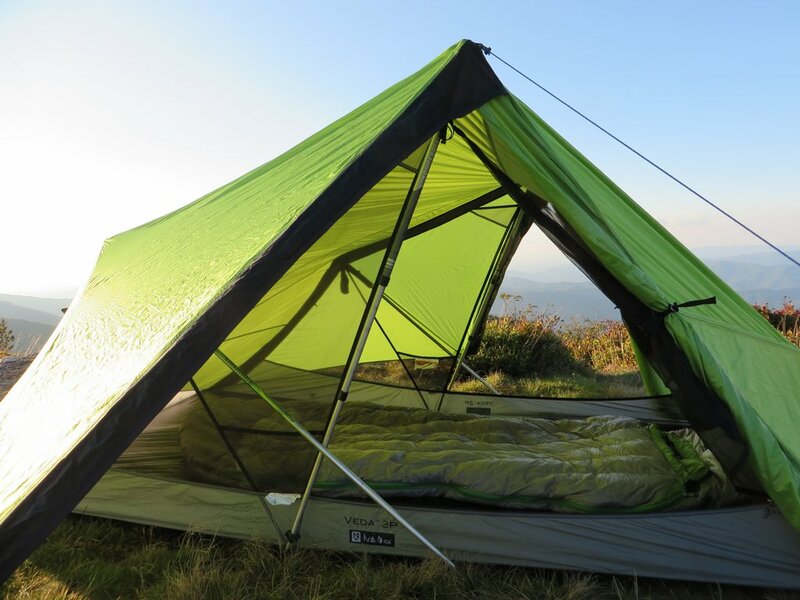 This combines to make a massive amount of internal living space that I haven’t seen before on a tent that relied entirely on trekking poles. 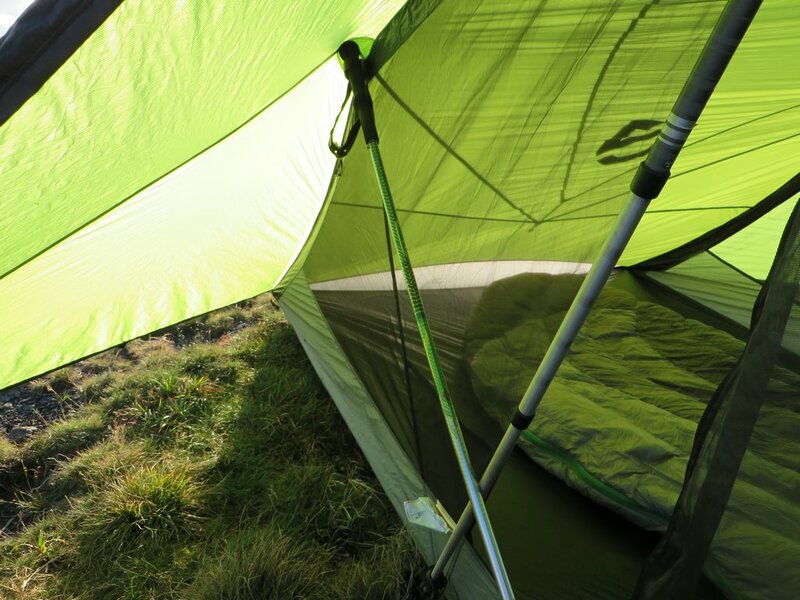 The tent materials feel soft to the touch, and the side walls are completely built from mesh, providing great ventilation. The vestibules are large, providing 23 square feet of dry storage and rain protection. The tent was tested under the worst conditions I could muster up for such a tent. 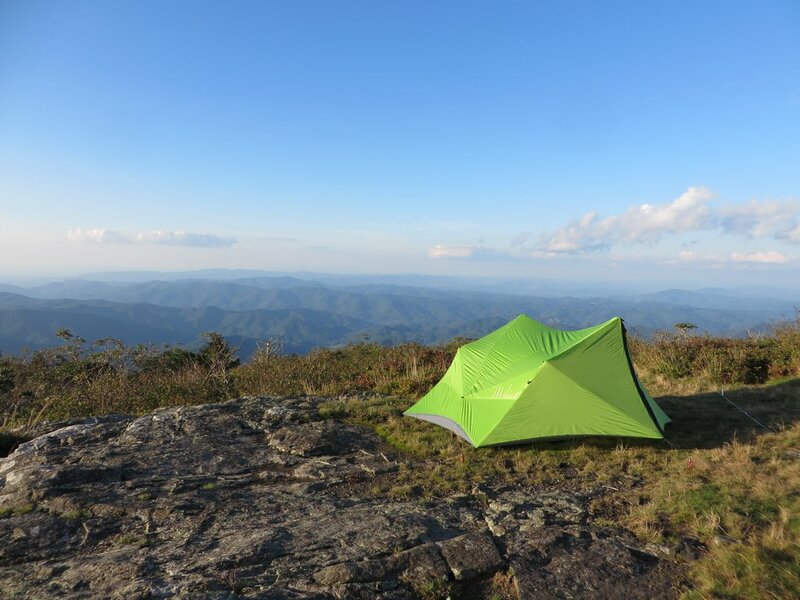 One such night, I found a 6000 foot, completely exposed bald high in the Tennessee mountains with little soil to anchor the tent into. Many of the tent stakes could not be hammered completely into the ground, as we were basically on bedrock. Some of the stakes were barely in half way. This isn’t where you should pitch your tent. Ever. High winds of 20-25 mph pounded the tent all night, blowing up from below us as, catching the inside of the tent. The tent survived with no issues at all. Not a single stake came undone, not a pole shifted, and the tent kept us warm and comfortable, despite clouds blowing through the insides of the shelter. Ventilation is fantastic. Small vents high atop the vestibule allow extra air flow when the doors are zipped up. These include mini awnings to keep rain out. The large mesh walls allow tons of air to flow through, so those hot summer nights should be a little more enjoyable. Pitching the tent is straight forward. 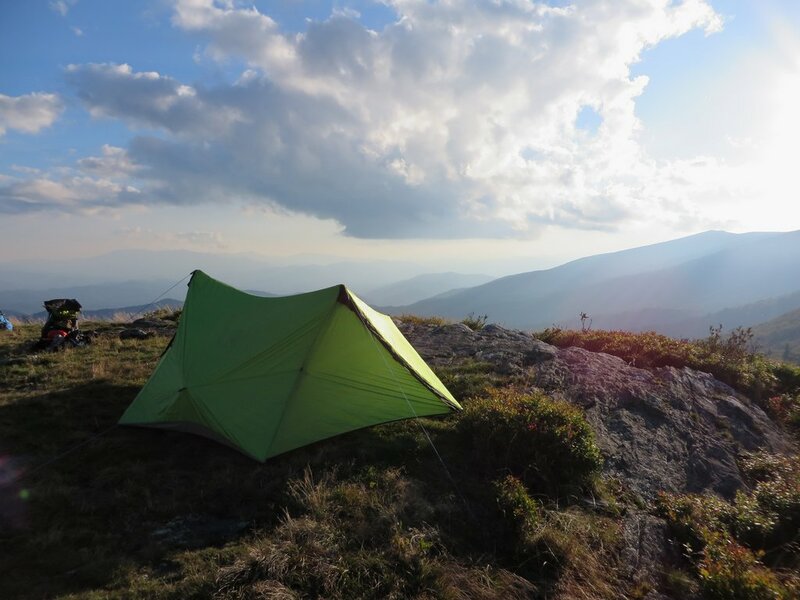 Simply stake out the four corners, install the vertical trekking poles, then the forward facing poles, and you’re ready to stake the rest of the tent out. Build quality is great, with durable materials used throughout, and no corners cut to shave weight unnecessarily. Livability is fantastic. There is a massive amount of room inside the tent to move about, and you have plenty of elbow room. I could probably squeeze a 3rd person inside if I had to. Small diffusion pockets high in the tent allow you to place in a headlamp, and it softens the light inside the tent for a nice gentle glow. There is ample foot and headroom, especially after being guyed out properly. The vestibules are very large, and easily held all of my gear with plenty of room to go in and out unobstructed. The vestibules roll up completely, giving your huge viewing angles and ample opportunities for star gazing. The tent only comes with 6 stakes, and two guy-out lines. This is enough stakes to pitch the tent, but not to apply any guy-out points. I don’t feel this is nearly enough. I immediately added 5 extra stakes and extra guy-out lines to add stability and create more internal living area. For normal weather conditions, the included is plenty, but you never know if there will be a storm rolling in that dodges the forecast. I definitely suggest supplementing the tent with extras. High winds, despite not budging the vital points: poles, stakes, or corners of the tent, did produce lots of buffeting in the hard wind. It didn’t create stability issues at all, but the noise was distracting and woke me up at 4 a.m. when a hard wind storm rolled in. This also shook moisture off the tent and onto my sleeping bag (we were camping in a cloud, and any tent will be soaked at this point). 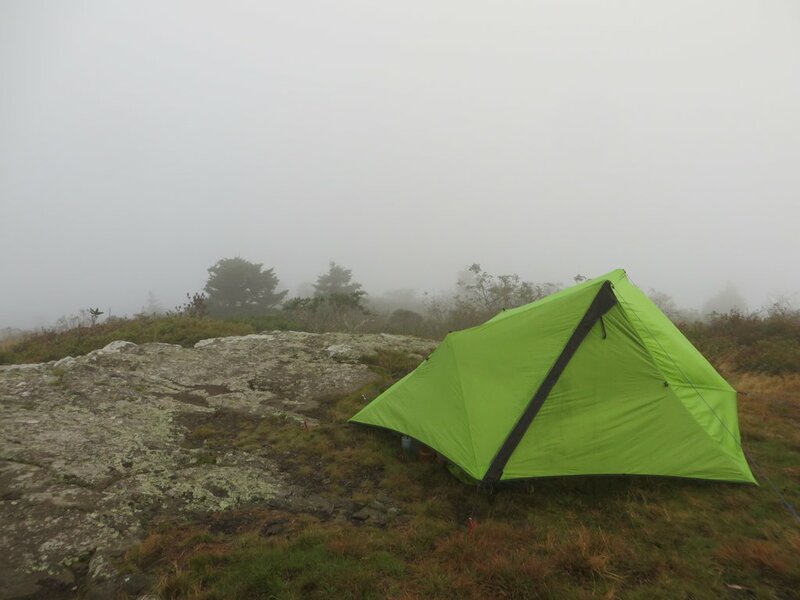 Tightening down the vestibules helped, but it was somewhat unavoidable in the conditions we subjected the tent to. The single wall contruction can create a wet environment in very humid conditions. 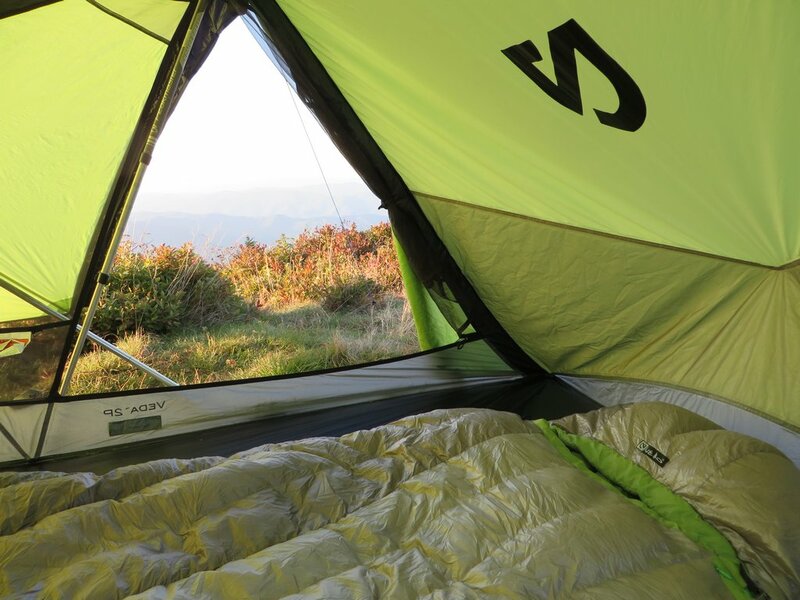 No tent can eliminate condensation when the air is wet, no matter how much ventilation you have. If you’re rubbing your sleeping bag across these walls, you could pick up some moisture. Honestly, I tested the tent in conditions that I did not expect any 3 season tent to survive, but this one did. It even excelled. I kept opening my eyes during the storm to look for flailing corners, and stakes, and it never happened. Other solid tents next to me were swaying and shaking in the wind, while the structure of the tent hardly moved at all. There was certainly some buffeting, but hard winds in terrible soil wasn’t enough to pull down this sturdy, roomy shelter. The tent creates a massive, breezy living enfironment that provides a cozy enjoyable living space to ride out those tough storms. Flapping walls and a light misting effect aside, this is a great tent if you’re looking for maximum livability with minimal weight costs. Throw in some extra stakes and guy-out line, and you have an attractive shelter that will provide many nights of good, confident sleep.